Laminated write-on/wipe-off surface wipes clean with a damp cloth. Great for organizing by the quarter, half year or full year. Reverses from a vertical to horizontal layout. Generous space for writing daily events. Unruled daily blocks. Ideal for conventions, meetings or company events. Includes water-soluble marker and hangers. Calendar is printed on recycled paper. Size: 60 x 26; Page Color/Theme: Yellow/Blue; Edition Year: 2019; Calendar Term: 12-Month (Jan.-Dec.). Packaging contains 100% post-consumer recycled content. 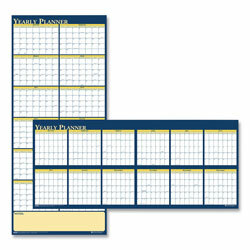 Multi Wall Calendars and Refills from House Of Doolittle! 99 In Stock today.